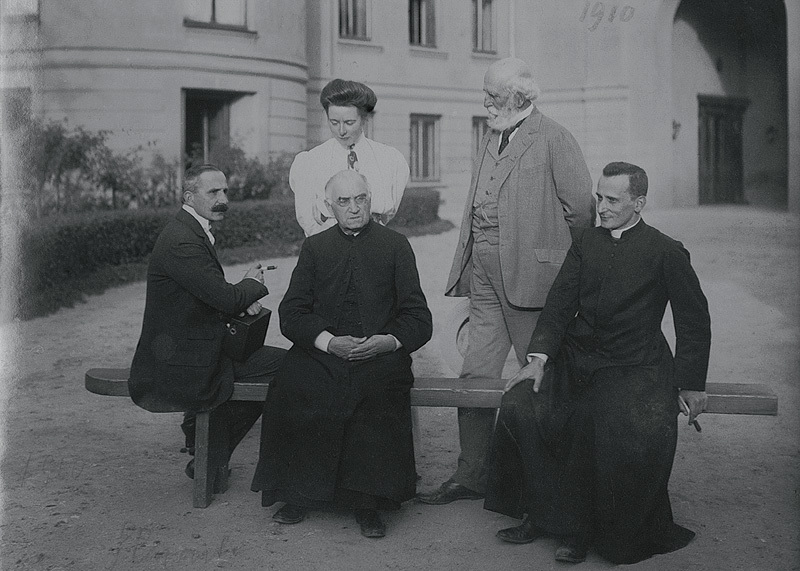 Above: Prince Roman Sanguszko, Father Adam Stefan Sapieha, Parish Priest Gromadzki, Paweł Sapieha, and Janina Rzyszczewska in Sławuta, 1910. Most of the landed gentry were passionate Catholics, but there were also families of the Protestant denomination. They regularly attended Mass, tried to obey the Ten Commandments, and provided financial support to the Church, often paying for renovations and church furnishings from their own pocket. Many landed gentry were rewarded for their services with the honorary title of papal chamberlains. Some of them became members of the clergy and played an important role in the Catholic Church, one example being Saint Ursula Ledóchowska, the Mother Superior of Congregation of the Ursulines of the Agonizing Heart of Jesus (Zgromadzenie Sióstr Urszulanek Serca Jezusa Konającego). Thanks to her work and competence the Congregation developed quickly during the interwar period, providing educational opportunities to others, especially children and young people, for whom the Ursulines organised houses in Poland, on the eastern frontier, in Italy, and in France. One of leading figures of the Polish Church in the first half of the 20th century was Cardinal Adam Stefan Sapieha, the Metropolitan Archbishop of Cracow. He organised help for the poor, for instance, during World War I he was active in the Prince-Bishop Committee to Aid War Victims (Książęco-Biskupi Komitet Pomocy dla Dotkniętych Klęską Wojny), in interwar Poland he supported Caritas, and in the 1930s he co-created the structures of Catholic Action (Akcja Katolicka). Sapieha also founded parishes, built churches, brought religious orders over, and took care of priests’ education. Called the Stout-hearted Prince, Cardinal Sapieha was a firm foundation of the Catholic resistance against the German occupier during 1939–1945. He supported research institutions and Catholic press. After World War II he established Tygodnik Powszechny—a Catholic weekly—and was a superior of Karol Wojtyła, who went on to become Pope John Paul II. Cardinal Sapieha ordained young Wojtyła a priest and supervised his intellectual and spiritual growth. For the Pope Sapieha was a role model of a true Church leader.